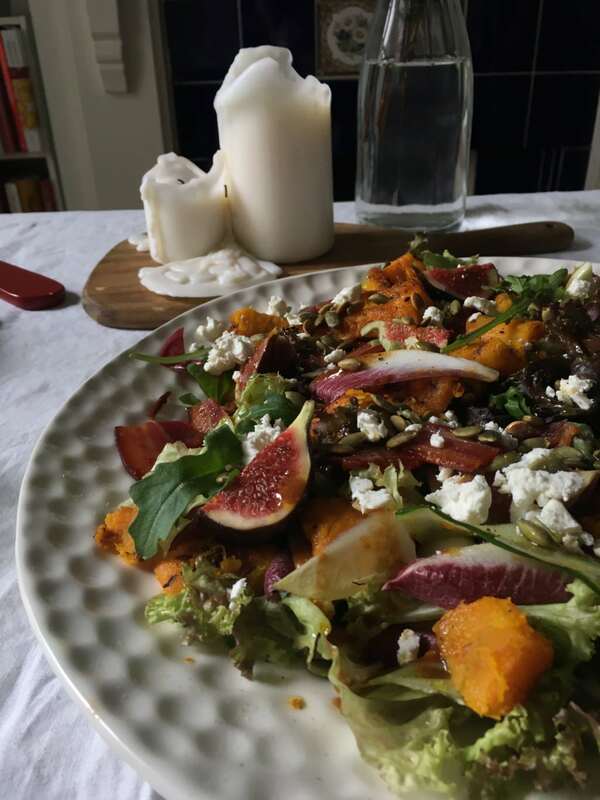 This seasonal pumpkin salad with fig & goats’ cheese is so full of the joys of autumn I simply love it! I have this thing with pumpkins, they just bring me so much joy to look at and eat that I can barely walk past them without buying one. Seen as my local greengrocer has a lovely display of brightly coloured seasonal squashes at the front of the shop I’m currently bringing home pumpkins home like little lost kittens! Although I’m perfectly happy to have them brightening up my home, I thought seen as we’re still a month away from Haloween I better cook one up before the collection gets out of hand! 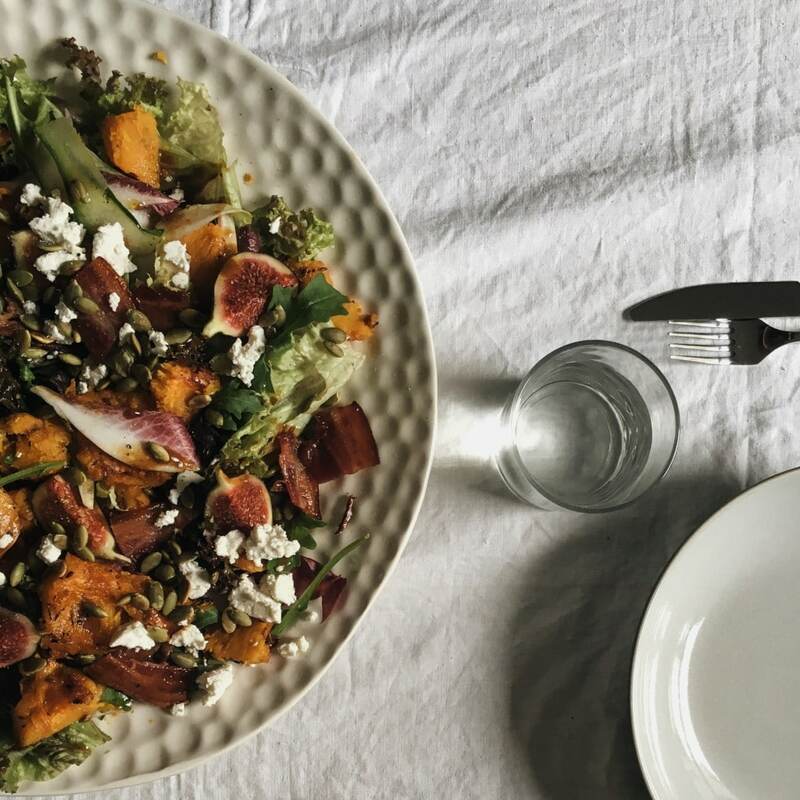 I’m a big advocate that salads aren’t just for summer, and this pumpkin salad with fig & goats’ cheese is just the ticket for the transition into warm salad season. The spices added to the pumpkin for roasting bring depth and a little heat with the cinnamon adding that extra hint of the cosy season upon us. The soft squash contrasts wonderfully with the crispy chicory and the sweet figs and goats’ cheese combo is always a winner. This is a lovely simple bright supper to make as the evenings draw in. Oh, and the method I suggest below is my absolute favourite way to cook crispy bacon which is amazing in salads! A couple handfuls of other salad leaves – rocket, little gem, red oakleaf etc. Place the pumpkin wedges into a roasting pan and drizzle with oil; dust each slice with a little cinnamon and sprinkle over cumin seeds and chipotle flakes. Roast at 200c until cooked through and caramelising slightly. Toss the pan once during cooking. Remove the skin before serving if you prefer. Line a tin with baking paper, lay rashers on the sheet and cover with a second sheet of baking paper. Place another heavier tin on top to keep the bacon flat and bake in the oven for 20mins. Cut into squares once cooked. To assemble the salad: Separate the chicory leaves – slicing the larger ones in half lengthways and add to salad bowl or platter with the other leaves; top with the warm squash, fig quarters and bacon; top with crumble the goasts’ cheese followed by toasted pumpkin seeds; dress and serve. I am a podcast junkie – I listen to them on a daily basis and love their company when walking or travelling, whilst working, when I’m doing house chores or in the wee hours during bouts of insomnia. 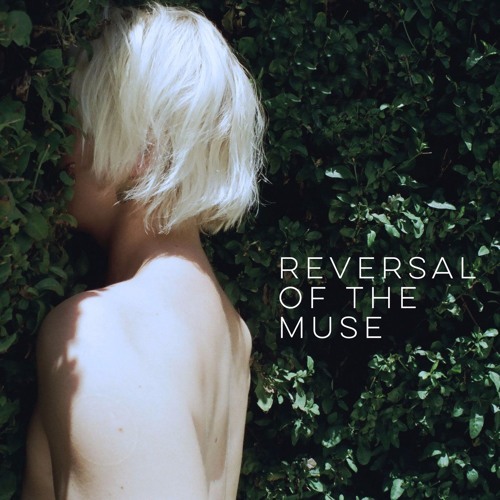 As I listen to them so much I’m always on the hunt for new shows to download and my current favourite new discovery is a show called ‘Reversal Of The Muse’. 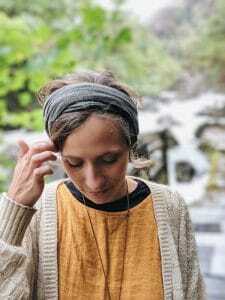 The podcast is hosted by the amazing Laura Marling and features Laura in conversation with a variety of fellow female musicians and women who work in the music industry. 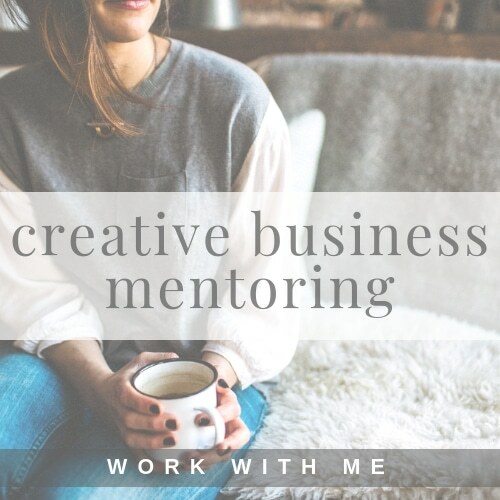 “Reversal Of The Muse began as conversations between friends about female creativity. In reversing the muse it became an experiment. As a small part of the global conversation about women in the arts, it became an obsession. It occurred to me that in 10 years of making records I had only come across two female engineers working in studios. I’ve been telling everyone about this podcast and I wanted to share this recommendation here. I frankly feel it’s a bit weird that I’ve never really engaged with the fact that there is almost a complete lack of women involved in the technical side of music creation, so I feel like I can’t stress enough how great it is to hear these conversations. Each episode has been fascinating to listen to and has really got me thinking – about women in music, female creativity and gender roles within the workplace in general. If you’ve listened to it I’d love to know your thoughts ! Listen to the podcast at reversalofthemuse.com or subscribe via iTunes. 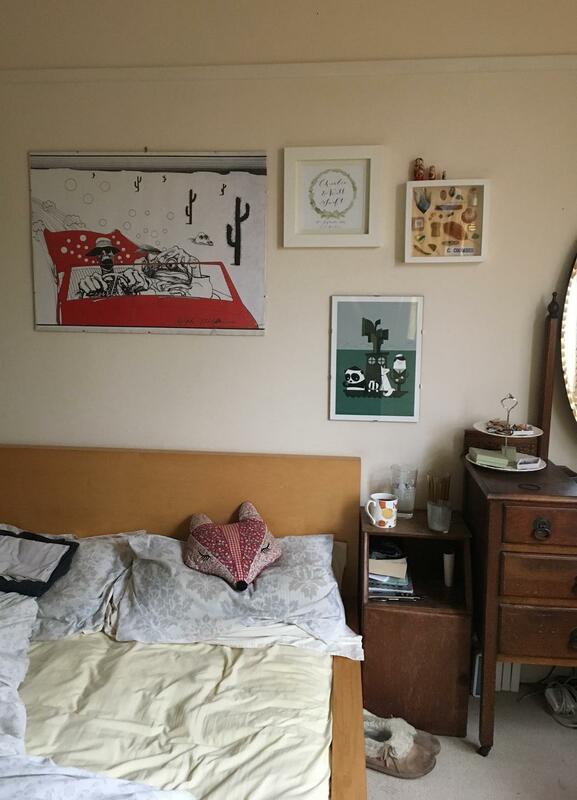 We moved house back in the middle of July so in some ways our previous place seems like a bit of a distant memory already, however I wanted to jot a few things down about our dear old flat for memory’s sake. The small but lovely kitchen where I experimented with food, learnt new skills and my love for cooking truly grew. And the oven which I always accidentally set to grill. So many dinner parties. 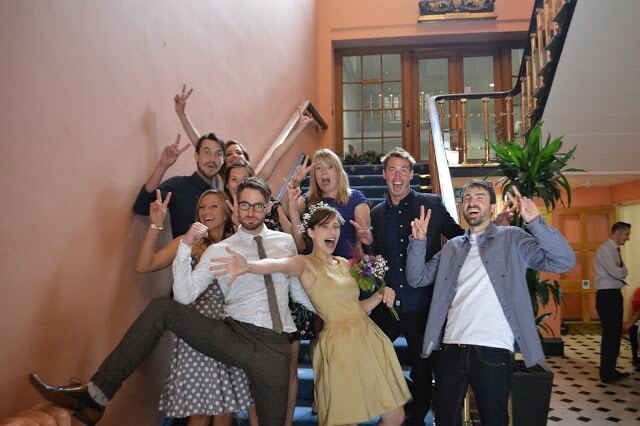 Especially the ones that started out so civilised and ended with dancing on sofas. Parties with people crammed into small rooms. Brilliant nights spent with best friends. Countless bottles of wine. The often overgrown garden belonging to the downstairs flat but sometimes shared. It may have been filled with Japanese knotweed and a hideous amount of earwigs but that didn’t stop epic BBQ birthday parties. The girl who lived downstairs who became one of my best friends. Games nights on cosy evenings. The wind howling down the chimneys and rattling the old wooden window frames. Hours spent together planning and crafting a wedding. Watching foxes from our windows. The 2nd neighbours we didn’t get on with who managed to have fun far too loudly, even at 2am on a Tuesday. The view across the city. Sitting on the bay window drinking trying to make the most of summer evenings. 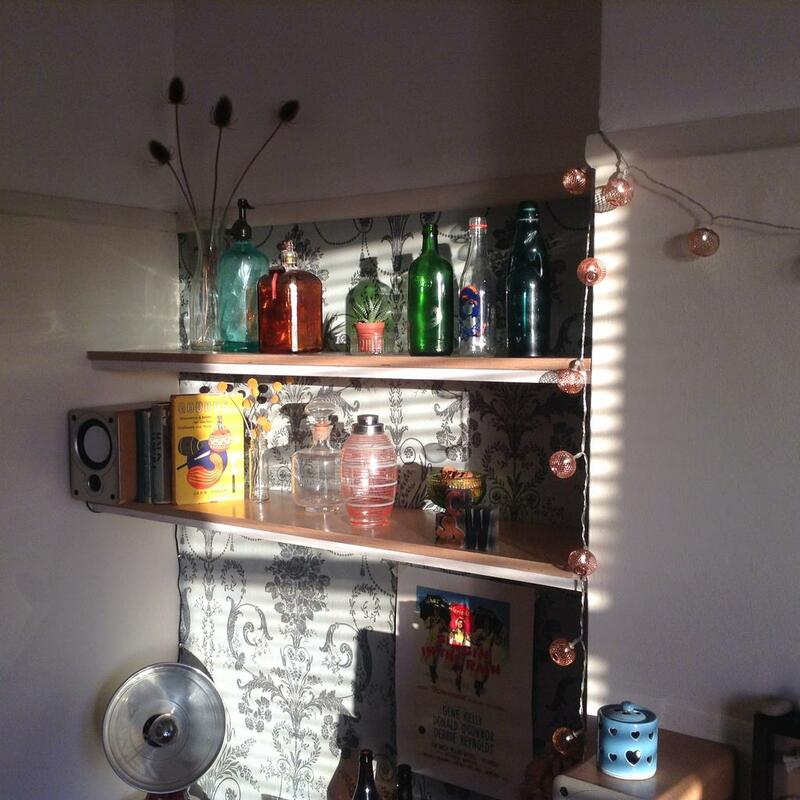 The afternoon light that filled the living room. 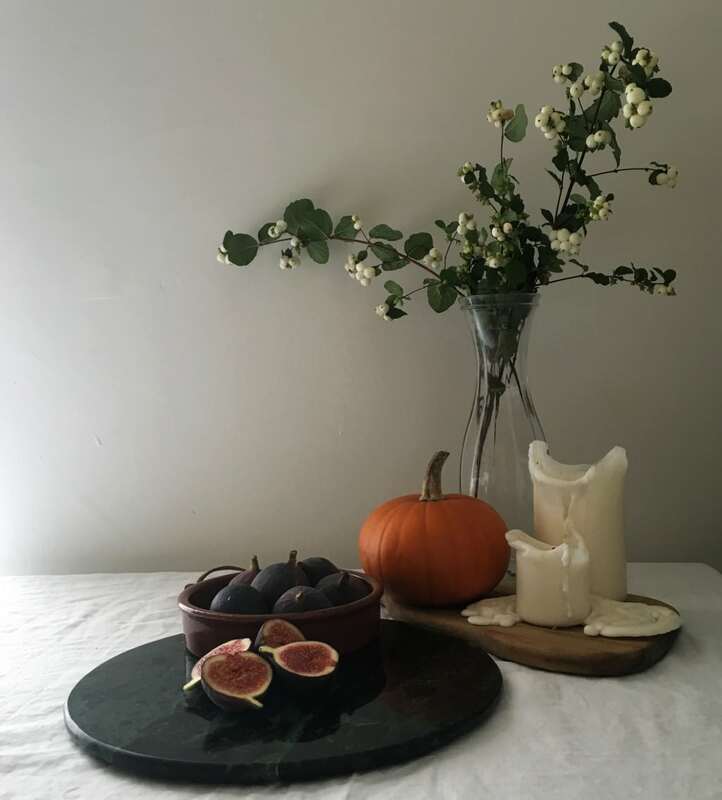 That time I came home to pumpkins and a marriage proposal. … Farewell Number 36 – you were pretty awesome. Evening meals eaten in the garden. Washing hung out on the line. A lack of storage space that’ll take some getting used to. Vintage furniture purchases. New neighbourhood to discover. Spaces filling up with new plants. 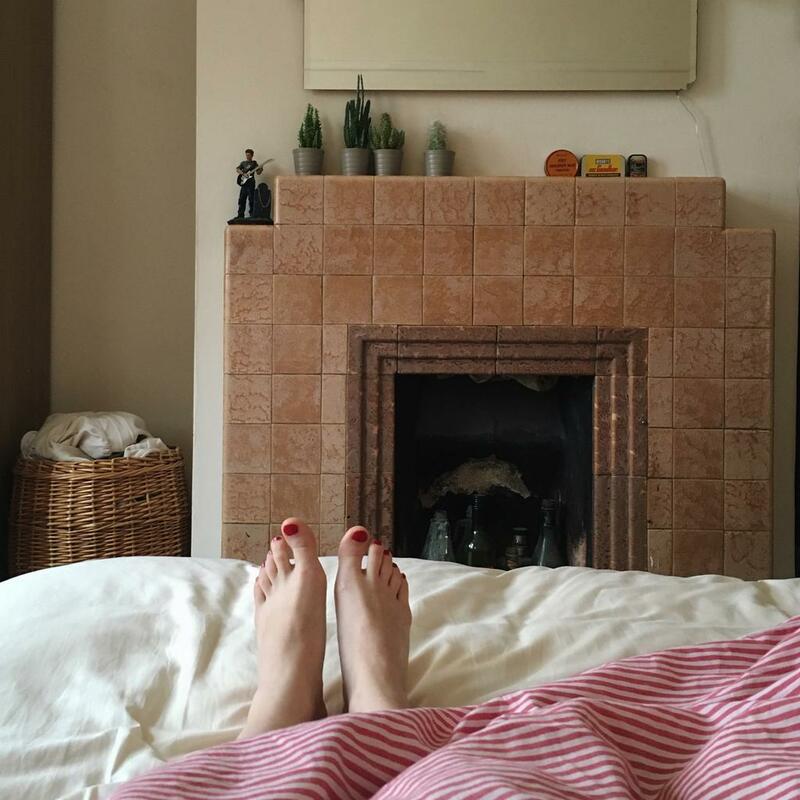 Magical morning light that makes patterns on the bedroom walls. I’ve made a playlist of new music for these last days of summer. Hazey tracks that suit the mood of this changeable weather and won’t quite let go of the summer vibes. Listen to this playlist it whilst enjoying the September sun or during your last barbeque of the year. Listen to it while getting cosy at home and dance around your house while it’s stormy outside (it’s a good playlist to dance to). Listen to it in between obsessively listening to the new Glass Animals album like I am. 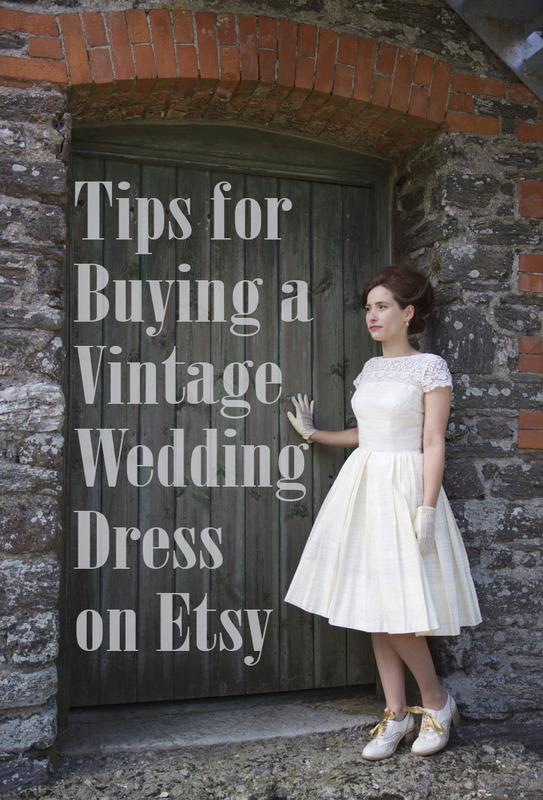 It became clear quite earlier on that buying a vintage wedding dress on Etsy was going to be the way forward for me. I always had a very clear picture in my head of what style dress I wanted for my wedding but I knew early on, after peaking in a few boutiques that I wasn’t going to find what I was after on the high street. Another thing I was sure of is that I didn’t want my wedding dress to come with a crazy price tag! If you’re looking for a wedding dress that’s unique and doesn’t cost the earth then going vintage is the way forward. One of the many beauties of using Etsy is that you are able to browse items from a multitude of different vintage boutiques at once, making finding your dream dress that much easier. I found that the best boutiques were based in the USA but that the vast majority delivery internationally. Price wise, in my experience at least, vintage dresses on Etsy seem to be a fraction of the cost of dresses in bridal boutiques. Mine was less than £200! 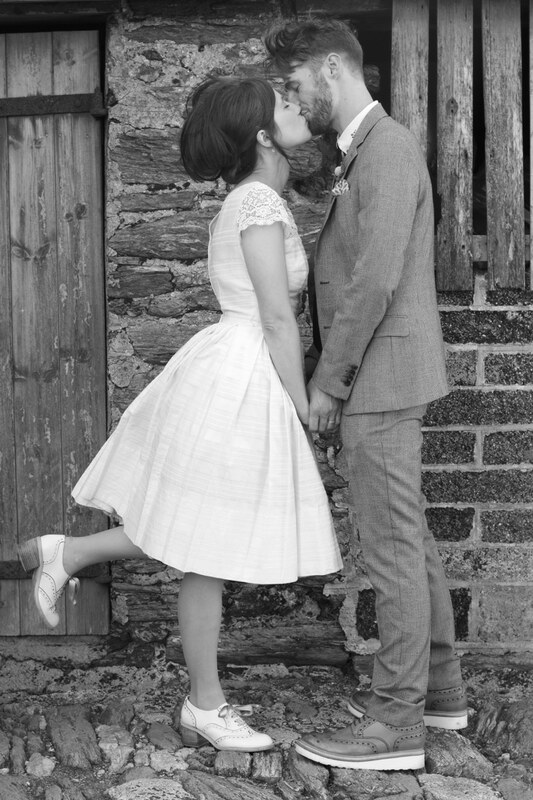 So if, like me, you’re keen on a genuine 1950’s tea dress or whether your bridal style inspiration is anything from 20’s glamour to 70’s boho – there will be a vintage wedding dress on Etsy that could be perfect for you, not to mention one that comes with a whole history of its own. When browsing on Etsy you can click the heart to favourite any item you like the look of. Search for dresses in the style or era you’re looking for then use the favourites tool to keep track of dresses on the ‘maybe’ list; saving them for looking at in more detail later. Etsy is also very clever at showing you lovely items related to your favourites so next time you log on your home page will be full of dresses that will be up your street. First things first you need to know your vital stats when looking to buy a dress online. As well as the garment measurement, Etsy stores tend to include their model’s measurements too and often use the same model for all their listings. Study pictures of the model in other items and get a feel for how you’d compare. Obviously comparing yourself to a model is not normally sensible life advice but seeing how my dress looked on the lovely Consetta’s Closet model and comparing her measurements to mine definitely helped me get an idea of how the dress might fit me – especially height wise. have a professional seamstress deal with anything major like letting out seams or adjusting hemlines. You make be brave enough to attempt smaller modifications yourself. For example, I unpicked bands which were at the edge of the sleeves with *extreme* care. 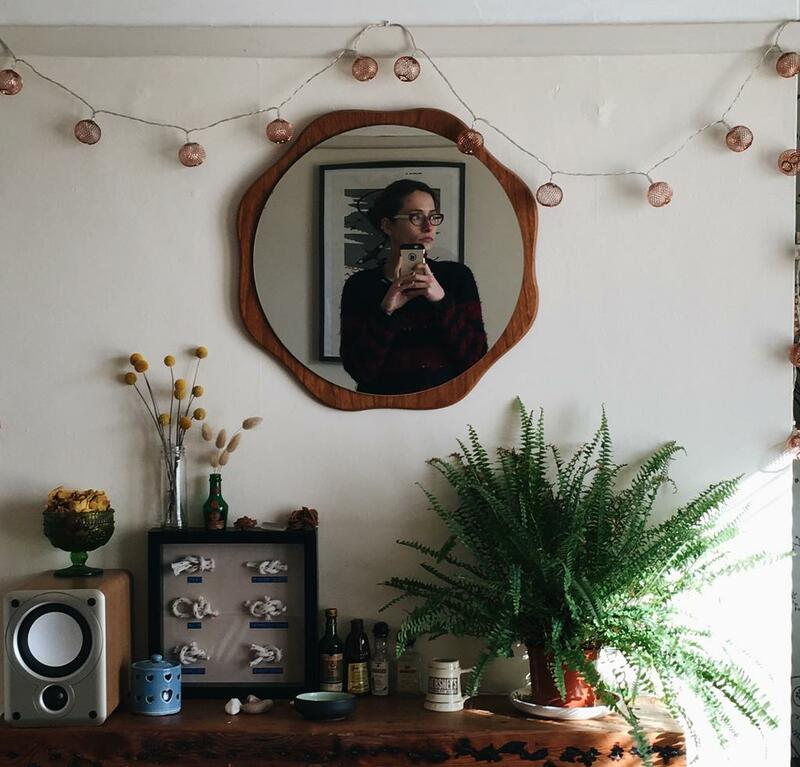 Sellers often post sneak peaks of items due to be listed on Instagram and other social media channels so if you see something that takes your fancy you can be poised to snap it up. Etsy sellers tend to be lovely so don’t be afraid to contact them with any questions you might have about the condition or details of a dress. Ultimately they can’t make your mind up for you but I’m sure sellers would be happy to help if they can. You should expect to pay import duty if you’re buying a dress from overseas. My dress actually managed to avoid it but many an item I’ve bought from The States has not. There are details on what you can expect to be charged here. The most annoying thing about being charged for imports isn’t the tax itself but the £8 handling fee. Just remember if you do return the item you can claim the tax back. Obviously, with buying a vintage wedding dress online there’s a risk that it won’t be quite perfect for you when it arrives but the end of the day if it’s not right you can always send it back or even sell it on. However, if you do find something right for you, you’ll have the pleasure of wearing something truly unique on your wedding day. Ultimately if you come across a dress you love the look of in your size don’t agonise over it, go for it! Concettas’s Closet – This is shop my lovely dress came from. 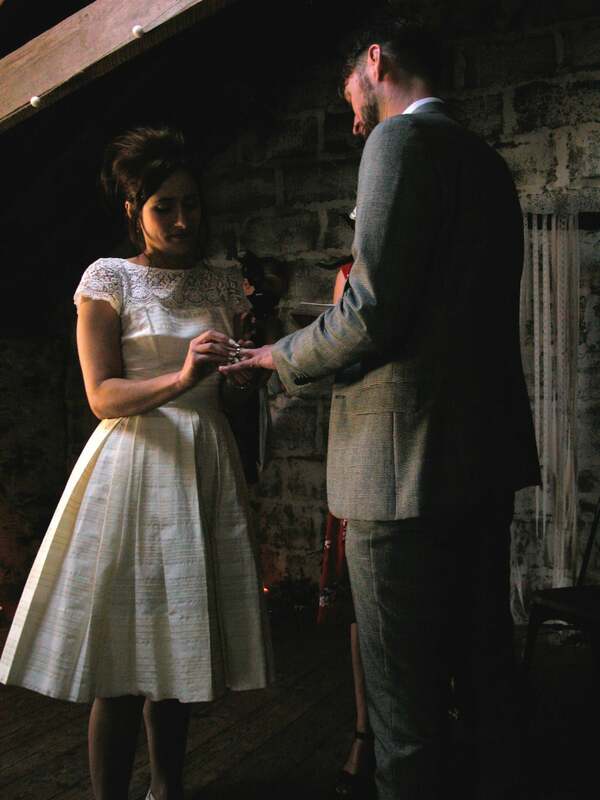 Currently stocking beautiful vintage wedding dresses from as early as the 1900’s! Not to mention their non-bridal selection is so dreamy! Dear Golden – A large and stunning collection of vintage bridal wear. The Vintage Studio – Perfect dresses for your inner the Prom Queen! In taking a chance on a vintage wedding dress on Etsy I found just what I was looking for! You can check out my bridal inspiration board on Pinterest. 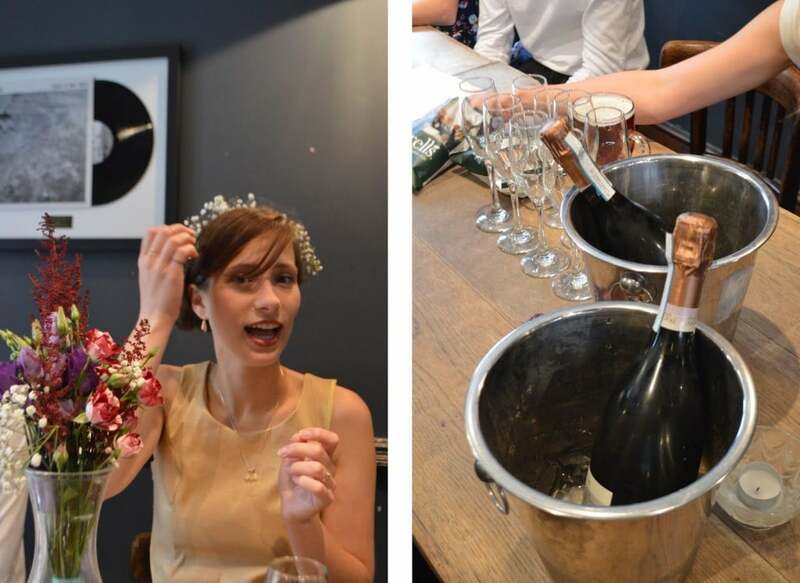 As I mentioned in my last post, our reason for doing our ‘legal bit’ separately was to give us the freedom to have exactly the day we wanted on our main wedding day; this included the ceremony itself being conducted by one of our best friends as well as writing our own wedding vows and choosing wedding readings special and personal to us. Technically we more adapted our own vows than wrote them from scratch. 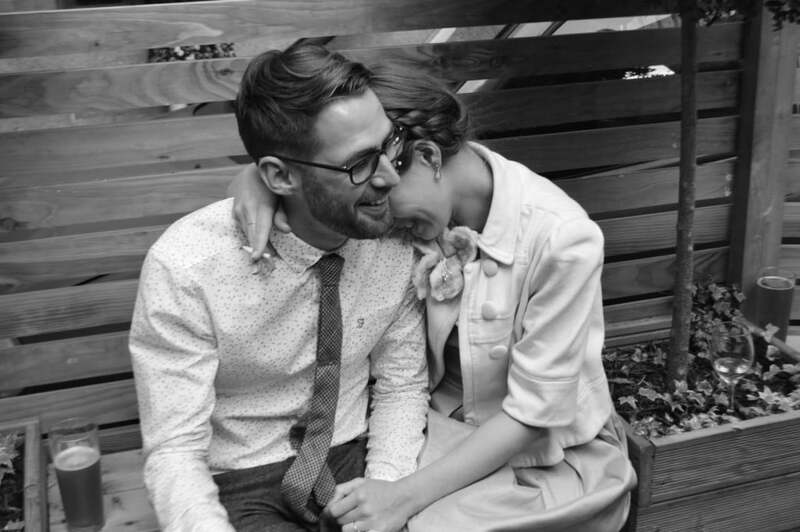 We found these vows on Pinterest which struck a chord and used them as a basis. We changed wording that didn’t work for us and then added our own few lines at the end. This is certainly a technique I would recommend as a starting point for anybody who might like to write their own but is apprehensive – it’s an incredibly daunting task! When I was wedding planning I became pretty obsessed with finding examples of what real people had chosen (opposed to Buzzfeed-style lists! 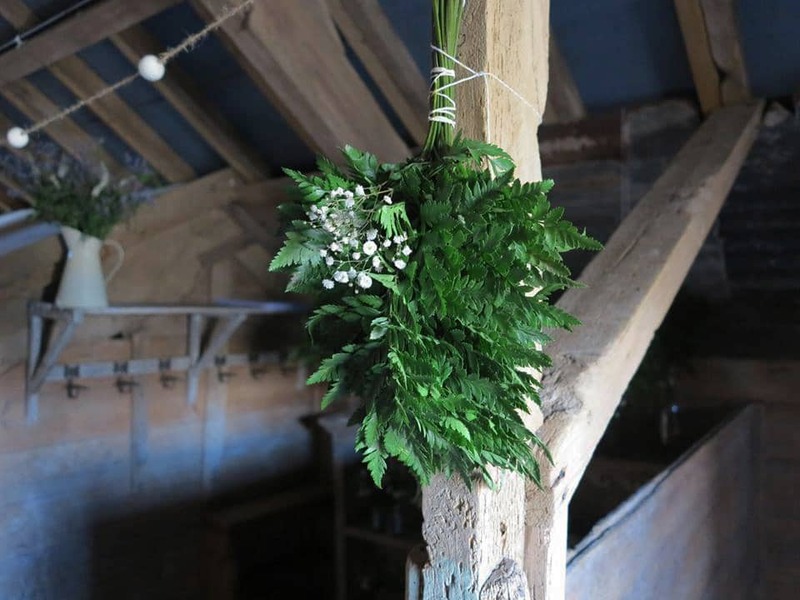 ); so I’ve included both our vows and wedding readings in full for anyone who is doing their own research or just fancies reading some pretty words. or that the future will bring us only sunny days. W: I can’t promise you that tomorrow will be perfect or that life will be easy. C: I can promise you my everlasting devotion, my loyalty, my respect, and my unconditional love for a lifetime. W: I can promise that I’ll always be there for you, to listen and to hold your hand, and I’ll always do my best to make you happy, and make you feel loved. C: I can promise that I’ll see you through any crisis, and laugh with you, dream with you, build with you, and always cheer you on and encourage you. C: I will promise to try my best not to make us late, to find the ‘funny’ in all situations, and make you tea every morning. W: I can promise that I’ll try not to rush you, I’ll go to gigs with you on a Monday night, be your kitchen companion and accept that there is no such thing as watching Buffy too many times. We really wanted to have readings from that rang true to our passions and geeky nature. I think researching words from the worlds of literature, cinema and music was one of my favourite tasks when wedding planning. I even found myself delving through our cookery bookshelve wondering if a reading of a favourite recipe would be appropriate! We decided against that, but it was fun to analyse unusual sources in the context of being read aloud as a wedding reading. In the end, we chose readings from my favourite film, Will’s favourite book and a song from a favourite band of ours. These were ‘Come What May‘ taken from Moulin Rouge which was read (rather emotionally) by Will’s mum, an amazing acoustic performance of ‘Sunday’ by Bloc Party by one of my cousins and an extract from ‘The Amber Spyglass‘ by Philip Pullman, read beautifully by another cousin. Listen to my heart, can you hear it sing? She sat down slowly, and he sat down beside her. Hope this may have been interesting or even useful. I’d love to know what you chose / are choosing / would choose!? Let me know! The “legal bit” took place in Bristol the Saturday before. 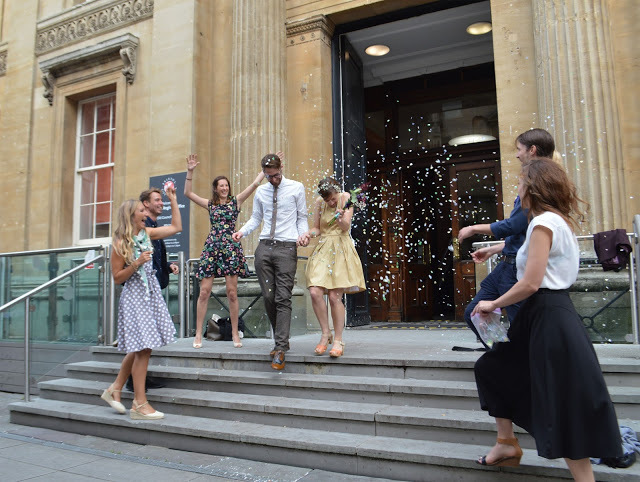 Will and I got ready and arrived together and met a few close friends at the Bristol Registry Office. In the end, we decided against inviting our families to this part. 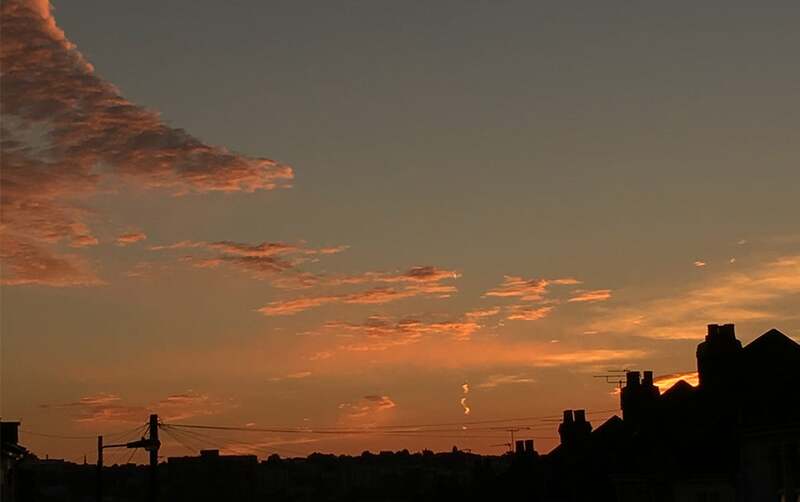 As they all live outside of Bristol and it felt like making too much of an event of it to invite them all along. The point was to keep it all low key and chilled out, which it was… and also quite a lot of fun. 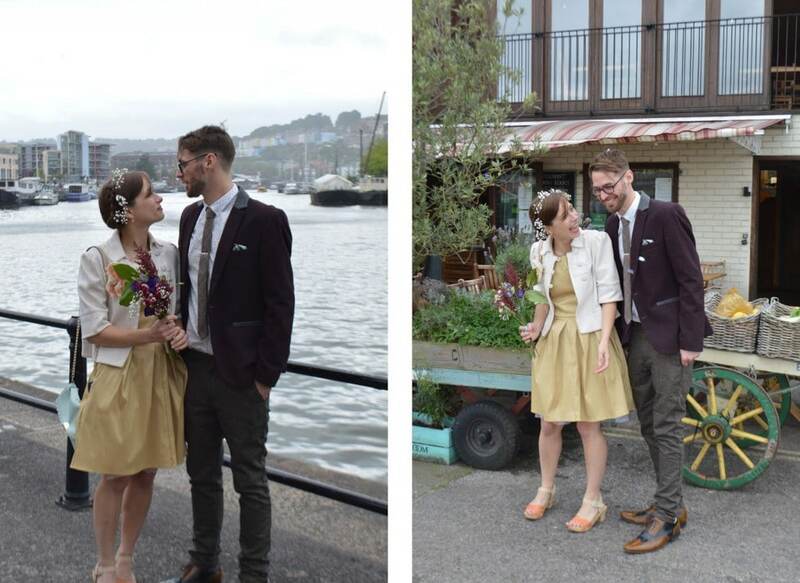 The morning ceremony at our Bristol wedding was short and sweet, we didn’t have any readings or exchange rings as we saved all that for the following week. We did, however, have an exciting surprise guest as my friend had just flown in from Australia. I didn’t know she was going to be there so I was pretty surprised and happy when I saw her as me and Will walked in together! 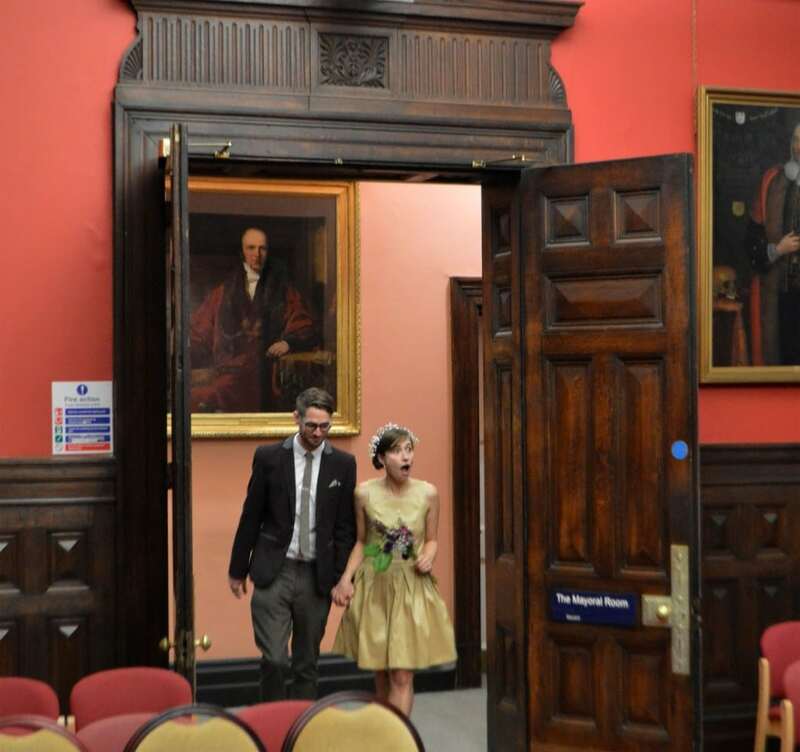 We also took the opportunity to walk down the aisle together to Father John Misty’s ‘Honey Bear‘ – we deemed the lyrics too risque for our proper wedding – so we loved that. After the ceremony, our group of nine took a little walk around the harbourside before heading to our favourite pub, The Christmas Steps. We had a yummy lunch and spent the majority of the rest of the day sat in the pub drinking bubbly, chatting and laughing. After a funny, merry walk home, the evening ended with a whole lot of dancing in our living room – which is pretty much my favourite way to end any night in Bristol. 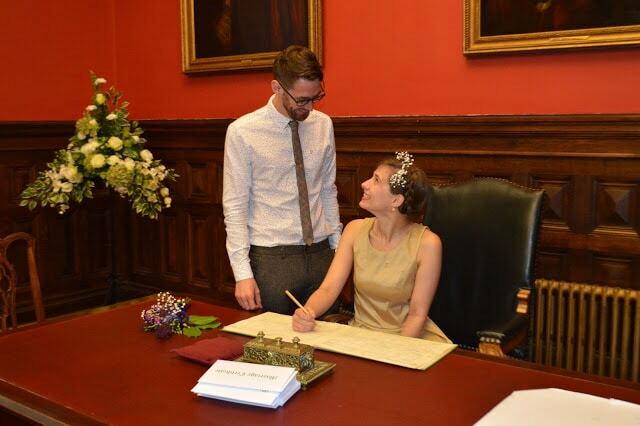 Doing our legal vows separately from our main wedding day may seem rather untraditional but it really did allow us to have a very personalised ceremony the following week in Devon. 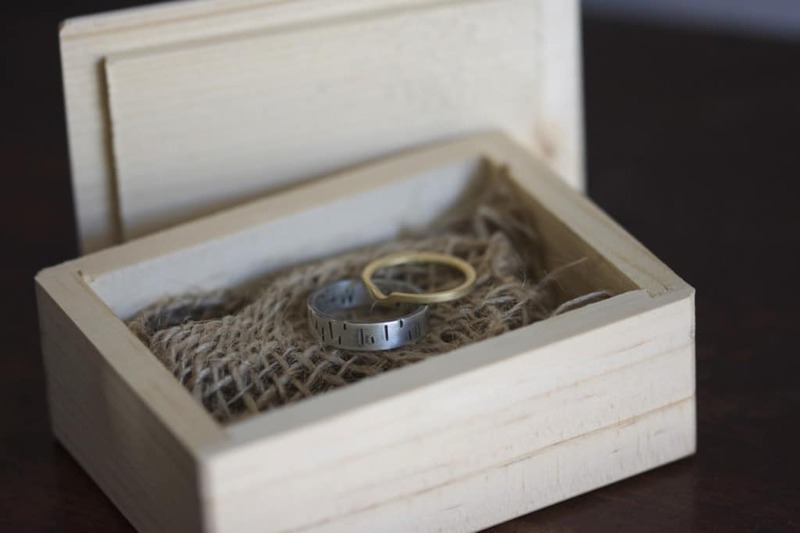 This included our own vows and our ceremony being written and led by a friend, which was incredibly special. 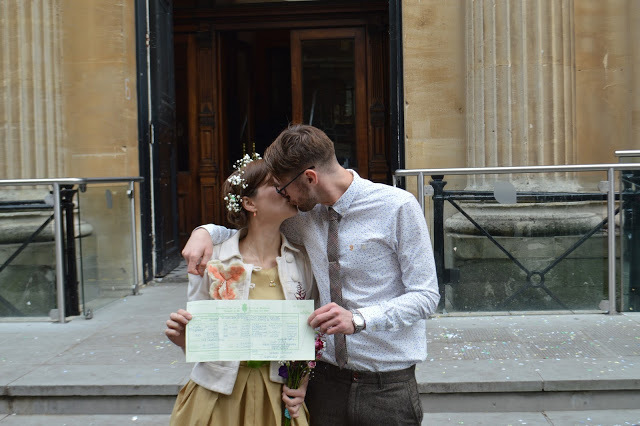 The day of ‘the legal bit’ turned out to be pretty special too and I also love that we sort of managed to get married in both a beautiful farm by the sea and got our Bristol wedding in our darling home city – who says you can’t have your (wedding) cake and eat it too?! A year on and I’ve noticed many couples seem to be choosing to do something similar to enable freedom on their ‘main’ wedding day. 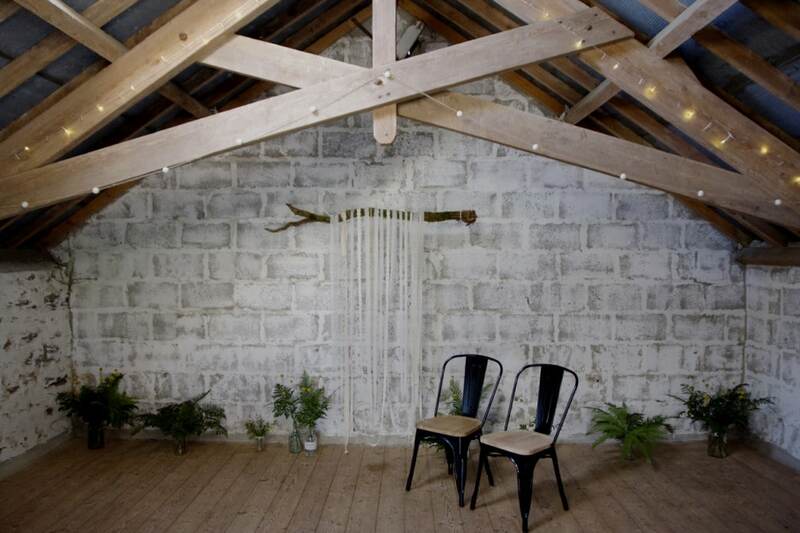 It’s definitely one of the best decisions we made and I’d certainly recommend it if you want to use a beautiful venue that might not have a license or don’t want to ferry people from one venue to another. That said some people might feel that doing the legal bit on a different day takes away from the big day somehow. What do you think? Would it / did it matter to you?